The domestic grocery industry has become increasingly competitive in recent years as new companies have entered the market and existing chains have expanded their store footprints. In August, Amazon (NASDAQ: AMZN) dove into the physical side of grocery after acquiring Whole Foods Market. Almost immediately, the company slashed prices on various staple products. Amazon will also likely leverage Whole Foods Market locations to bolster its online delivery model. With competition rising and razor-thin profit margins compressing further in the wake of Amazon’s gambit, marginal grocery operators must act strategically. There is little room for error. 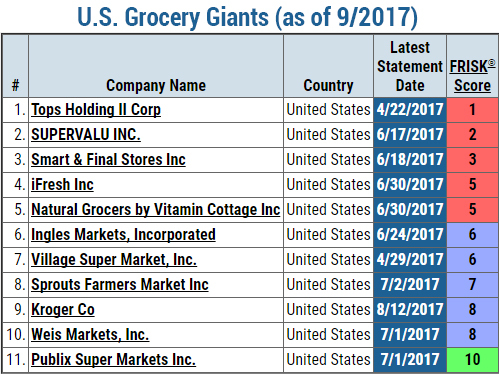 Suppliers, and other financial counterparties, should be watching for independent grocery customer risks, as well as a few of the larger chains. CreditRiskMonitor's proprietary FRISK® score is currently flashing early warning signs that some public grocery stores are in precarious financial health. A few of these names could be at risk of default or may eventually file for bankruptcy. The FRISK® score is a statistical model that measures corporate financial distress on a “1” (worst) to “10” (best) scale with a 96% accuracy rating for predicting bankruptcy within a 12-month period. Fairway Group Holdings Corp., also known as Fairway Markets, located in the Northeastern United States, filed for bankruptcy protection in May 2016. The primary factors that contributed to its decline were a lack of scale, incremental traffic declines, and, as is often the case in bankruptcies, a high debt burden relative to competitors. Fairway’s FRISK® score was trending in the “red zone” for more than a year prior to bankruptcy, warning CreditRiskMonitor subscribers of the company's higher-than-average financial risk. What’s more, the FRISK® score fell to the lowest possible score of “1” approximately six months in advance of bankruptcy, clearly highlighting Fairway’s increasing financial distress while subscribers still had time to reduce their financial exposure. In June 2017, CreditRiskMonitor’s news alert service showed that Moody’s gave Fairway a poor long-term credit rating “CCC” after it had emerged from bankruptcy. This low rating is still equivalent to a FRISK® score of “1,” which implies that not much has changed for the company at the financial level. With the grocery industry becoming increasingly saturated and price competition on the rise, all companies are affected. As Fairway Group shows, companies with higher than average financial leverage are even more at-risk. As of the first quarter of 2017, median debt-to-assets for the grocery industry was approximately 21%; at the same time, Tops Holding II Corp., Supervalu Inc., and Smart & Final Stores Inc. ranked in the bottom quartile versus industry peers at 87%, 41% and 34%, respectively. According to a study by the National Grocers Association, labor and healthcare benefit costs reached a new record for grocery stores. In this environment, any loss of incremental gross margin dollars will drive magnified damage to a company’s EBITDA and cash flow performance. For example, in the first quarter of 2017, Tops Holding actually lost 22% of its EBITDA after accounting for these higher costs and reduced gross margin as a percentage of sales. Results like this directly hamper the company’s ability to service its debt. 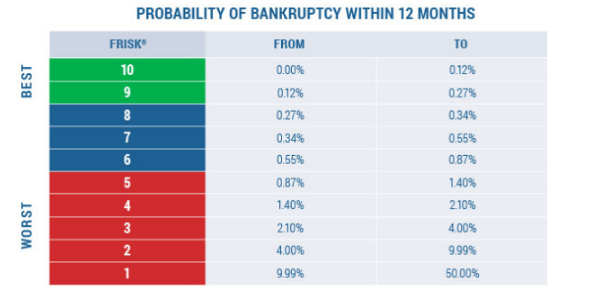 Currently, Tops Holding maintains the lowest FRISK® score of “1,” which indicates a 10%-to-50% probability of bankruptcy within the next 12 months. Supervalu (NYSE: SVU) and Smart & Final (NYSE: SFS) are also trending in the “red zone,” meaning that they have higher-than-average financial risk, as well. On the flip side, names like Publix and Kroger (NYSE: KR) are financially healthy, as they possess high FRISK® scores of “10” and “8,” respectively. Without even knowing that these companies have strong brands and highly efficient operations, the FRISK® score suggests that suppliers can breathe easier when dealing with these grocery chains. Food price inflation has picked up since March 2017 and often serves as a tailwind for grocery stores, yet increasing industry competition and rising operating costs are far more substantial headwinds. The FRISK® score is a best-in-class risk management tool that monitors public company financial health in real time. It is clearly showing that grocery stores underperforming today should be followed very closely for credit risk. Based on our review, Fairway Markets and Tops Holding are two of the riskiest operators in the grocery industry from a credit perspective. Unfortunately, industry woes are unlikely to abate anytime soon, especially when we consider the disruptive changes that giant retailers like Amazon are already beginning to implement. All told, suppliers should be on the lookout for companies that are in the FRISK® “red zone” or might be on the cusp of swinging into this high-risk category.